The cost and flexibility of yarn production are driving forces in technology research and development. hile quality, consistency and delivery time are important factors when marketing yarns, there is no doubt that cost plays a dominant role in marketing. 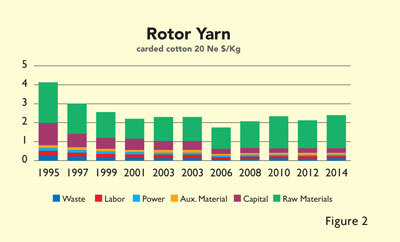 Figures 1 and 2, which are based on historical data from the Switzerland-based International Textile Manufacturers Federation (ITMF) — compiled from various editions of ITMF’s “International Production Cost Comparison” — for U.S. manufacturing, represent the cost of yarn production for combed-cotton ring-spun yarn and carded-cotton rotor-spun yarn. 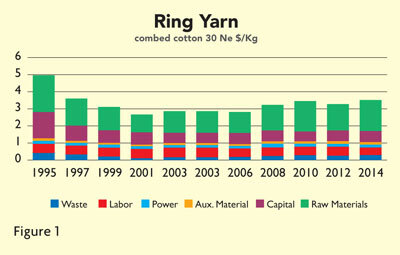 From these figures, it is evident which factors have the most significant impact on total yarn cost. 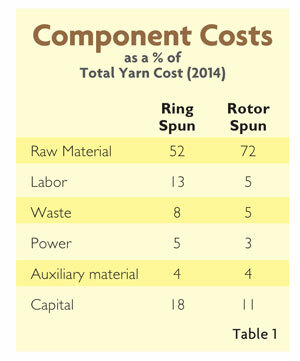 Table 1 shows that raw material cost dominates the final yarn cost, and represents 52 percent of the total cost for ring spinning and 72 percent of the total cost for rotor yarn. While there are differences in the percentage contribution of each component for the two selected spinning systems, it is apparent that in order to minimize yarn production costs, the component costs that must be controlled are raw materials, waste, power and labor. Recent developments and trends in yarn manufacturing have focused on these factors. Raw materials and waste, whilst used as independent inputs by ITMF, are considered together since there is no doubt that fiber selection can play a great role in the amount of waste produced during the spinning process. Indeed, it has been argued that it is possible to upgrade lower grade raw material, by using cleaning and even combing processes, but this practice would obviously increase waste. Traditionally, the fiber content of the waste was fairly constant, and thus, if the amount of waste removal was doubled then the amount of fiber loss also underwent a twofold increase. The present thinking is that because the raw material is a major cost, efforts should be made to optimize the processes so that effective cleaning is carried out with the minimum amount of fiber loss. This is evidenced by trends in blowroom and carding machines, where improved design that affords better control of airflow, can be coupled with sophisticated monitoring systems to assess the fiber content in the trash. 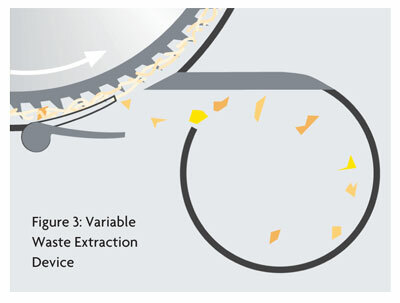 Control is achieved by changing the settings of the waste extraction unit (See Figure 3). 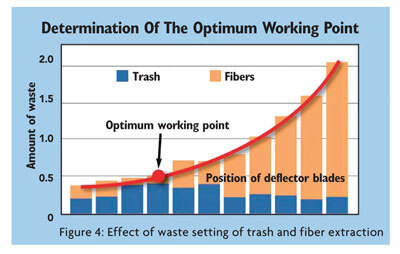 Figure 4 illustrates how it may be possible to increase trash removal without the usual increase in fiber loss. A supplementary approach is to reclaim fibers by reprocessing the waste generated in the blowroom, carding and combing. An additional aspect when considering waste, is the potential impact of foreign fibers and other contaminants. These bale impurities if not removed early in processing, can lead to contamination issues as fibers are redistributed during doubling and blending. Major breakthroughs have been made in the use of different light sources and sensors so foreign fibers that are the same color but chemically different from the raw material can be identified and removed. Detection of foreign fibers also can be carried out during later stages of processing, including yarn clearing; however, early elimination of the problem seems to be the most logical approach. It could be argued that the greater use of multiple drives in spinning machines could enable optimum fiber utilization because the potential to spin several smaller lots on one spinning machine, such as the Autocoro 8 manufactured by Germany-based Schlafhorst Zweigniederlassung der Saurer Germany GmbH & Co. KG, should result in less waste. The use of automation throughout the spinning process has reduced defects, and this in turn, has had a beneficial impact on potential waste. It seems inevitable that there will be a continued growth in the utilization of jet/vortex spinning, and there will be efforts to reduce the significant fiber loss which has been associated with this technology. Modern spinning mills are technologically advanced, and the increased use of automation has enabled the labor component of yarn production costs to be minimized. The conversion of fiber bales through to sliver is essentially one processing stage, and the use of monitoring and control systems ensure that very little human intervention is needed during this processing stage. An additional component, particularly in the processing of cotton, is the use of HVI bale data in conjunction with appropriate software, such as the EFS system from Cary, N.C.-based Cotton Incorporated, to ensure optimum fiber utilization. This approach also ensures a high-quality fiber blend that enables high efficiency during spinning. Indeed, the interaction between the fiber properties and machinery settings is extremely critical in determining the ultimate quality of both product and process. Automation such as autoleveling, automatic doffing transport systems, automatic cleaning, and automatic data collection for processes and products, are commonplace; and rotor and vortex/jet spinning together with winding, also utilize automatic piecing. These features reduce the labor component in the processing and hence total manufacturing costs. While automation offers the potential for significant savings in labor, it is usually accompanied by a reduction in flexibility since the production balance between different machinery can be upset by changes in count or twist requirements. The different manufacturers achieved the increases in productivity through combinations of increased machine width coupled with improved geometry so that maximum utilization is made of all the available carding surface area. In a similar vein, ring-spinning machinery has experienced an increase in the number of spinning positions per frame — up to 1,840 — which is beneficial in reducing the cost of automation per machine, while again reducing the number of machines needed to yield the same production levels. Furthermore, seemingly small technological improvements also impact labor requirements both in yarn manufacturing and indeed in subsequent downstream processing. An example of such a change is the ability to build yarn packages containing more yarn, with companies such as Schlafhorst claiming it can accommodate up to 20-percent more yarn on its open-end yarn packages. This not only means that there is a lower frequency of doffing — which should improve operating efficiency — but that there should be less labor needed in downstream processes since supply packages will need less frequent replenishment. When considering power, it is necessary to take a holistic view and consider the yarn manufacturing process as a total entity. In this respect, the building also plays an important role since there is an immediate building cost associated with the floor area utilized plus the ongoing cost of lighting and HVAC systems. There have been improvements in efficiency of lighting and HVAC systems and while it is probable that further cost reduction improvements will continue, the magnitude of these reductions will be relatively small. More efficient drives and controllers should lead to potential power savings in processing machinery, and in this respect, the use of multiple individual motors seems to hold promise. A major theme at ITMA 1987 held in Paris, was that many machinery makers promoted the use of individual spindle drives on their ringframes. While exhibitors had charts showing the potential power saving that could be achieved by using individual drives, visitors to the show were much more attracted to the significant reduction in noise, which accompanied the elimination of drive belts — an experience which demonstrated that excessive noise reflects wasted energy. Added advantages of the individual drives included simplified spindle speed changes and greater flexibility. The major drawback of individual drives however, was the much higher initial investment coupled with the limited availability of small motors that were needed if the number of spindles per unit space was to be maximized. Schlafhorst’s Autocoro 8 is an example of a machine that illustrates the reemergence of individual motor drives, where several components of the independent rotor-spinning units are driven by small computer-controlled motors. This not only enables lower power consumption, but also allows for greater flexibility, since different sections of the machine can potentially spin different yarns. The floor area occupied in a manufacturing facility has a significant impact on total power requirements, and thus optimum use of space is important. An obvious way to use space efficiently is to use machinery that offers higher productivity, such as machinery that runs faster. Such productivity increases can be realized by using higher spindle speeds, but higher speeds usually also mean greater power consumption by the machine. Another approach is to utilize technologies that enable higher productivity at the same spindle speed. Such increases can be obtained by using compact spinning, where it is possible to spin yarns that have similar tensile properties to conventional ring-spun yarns, but at lower twist levels, and hence, higher throughput speeds. A final solution is to optimize machinery design. For example, Rieter’s Jet Spinner is a double-sided machine that produces the equivalent of two single-sided machines, while using significantly less floor space. There is no doubt that at ITMA 2015, machinery manufacturers will exhibit developments that will address the major issues influencing cost of yarn production, and this also will be the continued focus of researchers involved in this area of technology. In the respect of the latter consideration, it is inevitable that there will be an expansion of the ongoing research into technologies that yield yarns with advantages over current offerings. The growth of interest in technical yarns to yield products with superior properties in respect of performance and aesthetics including comfort, will no doubt be the catalyst for this research. This will involve the ability to efficiently process newer fiber variants, both alone and in blends with other fibers, and the potential to create more acceptable hybrid yarns composed of filament and staple fibers. Editor’s Note: Dr. William “Bill” Oxenham is the Abel C. Lineberger Professor and Associate Dean of Academic Programs at Raleigh, N.C.-based North Carolina State University’s College of Textiles, Department of Textile Engineering, Chemistry and Science.